There’s nothing more extraordinary than enjoying an expertly prepared meal with good company. At Equinox Village, it happens every day. Our Executive Chef features brand new, farm fresh and seasonally inspired menus every week. From elegant dishes to comfort food, our residents are always eager to see what the chef has prepared for them. Lunch and dinner are offered, Monday through Saturday and on Sunday, a beautiful brunch is offered. Delivery service and takeout are always available. Our main dining room welcomes the residents with gracious, chef-prepared fine dining. There is a new, impressive menu offered daily that offers traditional cuisine with a distinctive flair. Our dining room offers you formal service in an open-seating environment. Weather permitting, you may also choose to dine outdoors in a beautiful garden setting with impressive views of Equinox Mountain. Delivery service and takeout are also available. 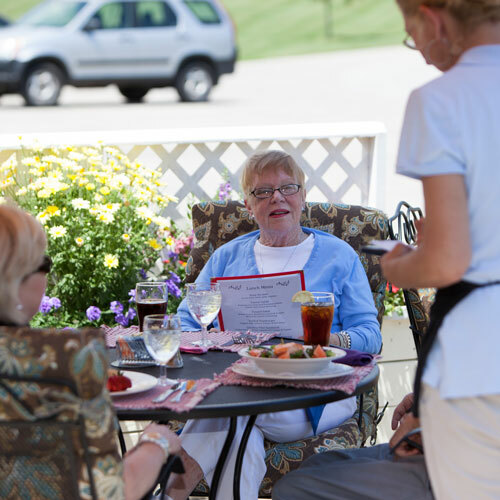 Our patio offers more informal meals in a beautiful setting. Open all day, the patio is filled with lush greenery and seasonal flowers overlooking the grounds and Mt. Equinox. Have a leisurely lunch or join friends for an informal dinner and choose your favorite entree or one of the daily specials. Our Private Dining Room is an intimate and cozy setting with a beautiful view outdoors to our patio. This room is a great place for getting together with family and friends for larger parties and special occasions. 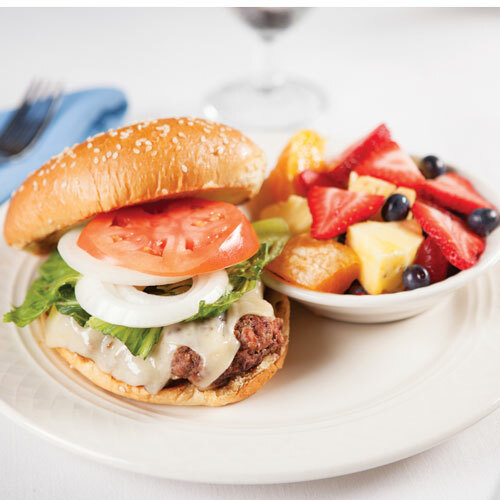 Click to view examples of menus: Lunch Specials, Weekly Dinner Specials, and Dinner Menu.